A guide to standards at Carnegie Mellon University. Need a Standard We Don't Own? Use the tabs above (Digital Collections, Finding Standards and Need a Standard We Don't Own?) to find specific information that will quickly assist you with your information needs. What Are Standards and Why Do We Have Them? A standard definition: "a recognized unit of comparison by which the correctness of others can be determined." Another definition is "a set of characteristics or qualities that describes features of a product, process, or service." Why do we have standards? "[Standards] simplify product development, reduce unnecessary duplication, lower costs, increase productivity, promote safety, and permit interchangeability, compatibility, and interoperability. They help to advance scientific discovery, and keep people safe by minimizing injuries and protecting key environmental resources." "They make modern conveniences possible: light bulbs fit into lamps, electronic files are transferred over the Internet, trains move between states because the tracks are the same gauge ..."
Standards are produced by scientific and professional organizations, trade organizations, and governments, nationally and internationally. In the United States, American National Standards Institute (ANSI) coordinates many standards developing organizations (SDOs). ANSI is also the sole U.S. representative to the International Organization for Standardization (ISO) and the International Electrotechnical Commission (IEC). Here's a list of Standards Developing Organizations (U.S. System). 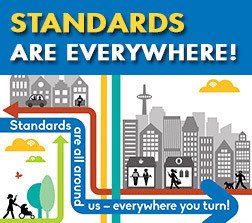 Do you want additional introductory information about standards? This looks promising! "This book includes a collection of standards-specific case studies. The case studies offer an opportunity to combine the teaching preferences of educators with the goals of the SEC (Standards Education Committee); providing students with "real-world" insight into the technical, political, and economic arenas of engineering."